Falvey Memorial Library :: Now available: access to Moscow News! Now available: access to Moscow News! 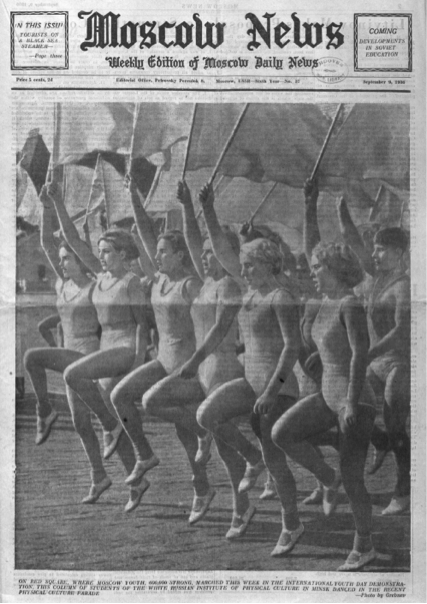 Cover of Moscow News, September 9, 1936. Read the longest running English-language newspaper published in Russia and explore Russian news coverage during the Stalin era, World War II, the cold war, the break-up of the Union, and the formation of the Russian Federation. The archive includes all available issues of the Moscow News and its short-lived sister publication, the Moscow Daily News (1932-1938). East View, the publisher, provides a curriculum guide with convenient access points to selected articles. Russian speakers and faculty interested in the Russian diaspora are invited to explore the recently completed digital archive of Za vozvrashchenie na Rodinu, or Return to the Motherland in English. This short-lived (1955-1958) biweekly newspaper was published in East Berlin with the intent to counter the narrative of Russian émigré organizations. East View is about to complete the digitization of the archive of Novoe russkoe slovo which translates into New Russian World. This Russian language newspaper was printed from 1910 to 2010 in New York, although the digital archive will not include the first eight years. The audience of this publication was the Russian émigré community in the United States. Look for a trial announcement in December. The University already has access to the Current Digest of the Russian Press through the Library’s collections. The Digest is, as its name indicates, a compendium of selected Russian language press materials translated into English. Coverage goes back to 1949 and includes translated news from all important news sources, including Izvestia and Pravda. Trial access will be available until December 13, 2018. Contact Jutta Seibert (jutta.seibert@villanova.edu) if you would like to recommend this database for purchase.